This just started as a spontaneous sketch in my sketchbook with my .5 mechanical pencil. For awhile I’ve been working on a personal project in fits and starts. I have a fair bit of material in my sketchbook, but I thought I would reveal the name of the project and the logo. 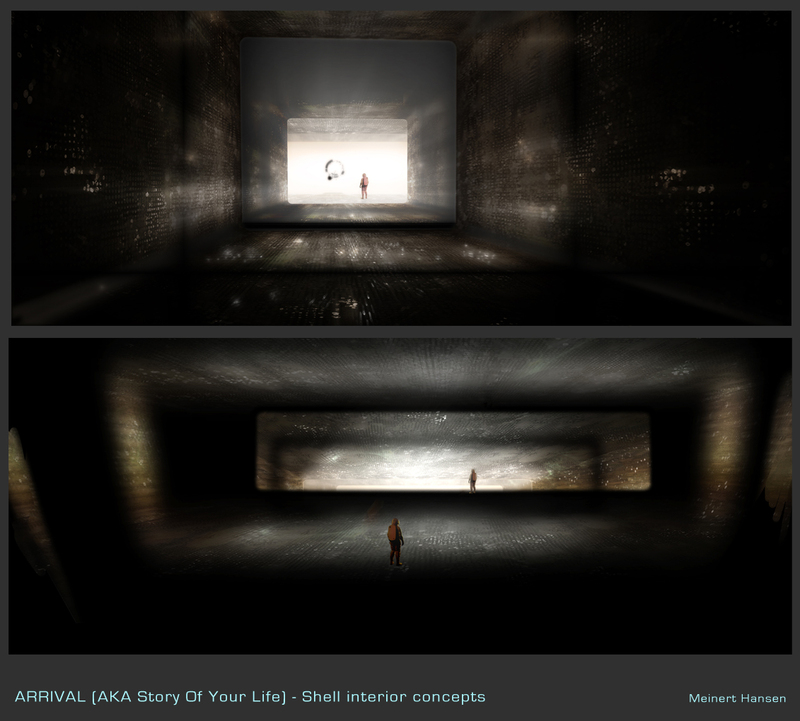 It will be a narrative art book with some actual video elements for promotion. Yes, it does deal with the planet saturn. This was the original title, which will now be the first part of the story: Part 1 – The Phantom Lines, Part 2 – The Order of Immaculate Orbit, and Part 3 – The Limitless Ether. Here’s a scratch-built model of Saturn which I’m working on, as part of a lot of miniatures which I’ll be building. 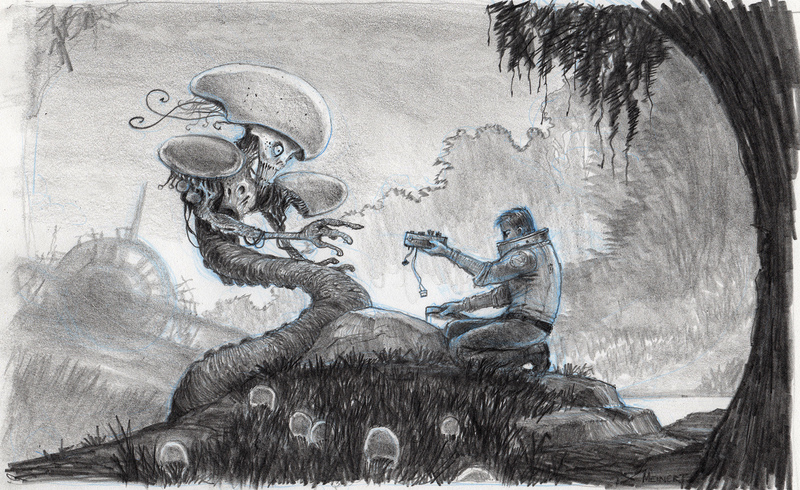 In 2013, I was contacted by Tony DiTerlizzi to create a couple of keyframe illustrations based on his book “The Search for Wondla”, the first book in his excellent science fiction trilogy. It’s a superb series, and it would be incredible to have it made into a feature film franchise or Netflix series. 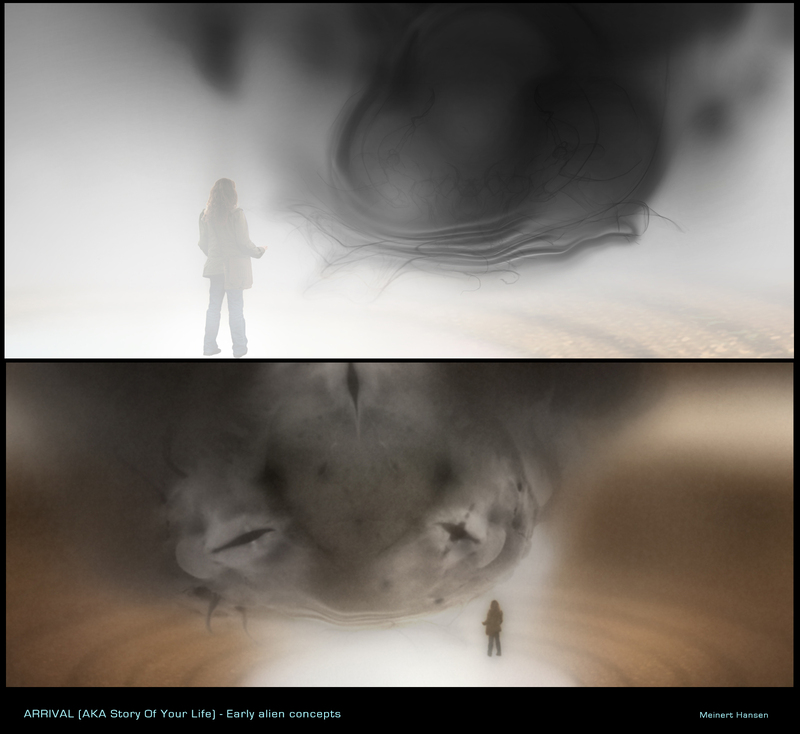 The final illustration, showing Eva and Muthr, beside the Goldfish flying car, the city of Solas in the background. My sketch of Solas, used for the final painting. Her’s the kit bashed car I built for the Goldfish to use for reference. Here’s the model car in front of my iMac, the Photoshop painting in progress. This way I can get the realistic lighting on the car, and refraction through the windshield. (Part 1 here) Once again, no spoilers. When I was asked to take a shot at designing the aliens for Arrival, I leapt at the opportunity. It was still the very early days of pre-production, and Denis and Patrice had already given the alien task to a couple of concept artists. The extraordinary concept artist Peter Konig was working at the same time as me, but I didn’t get to see any of his work till a few weeks ago. 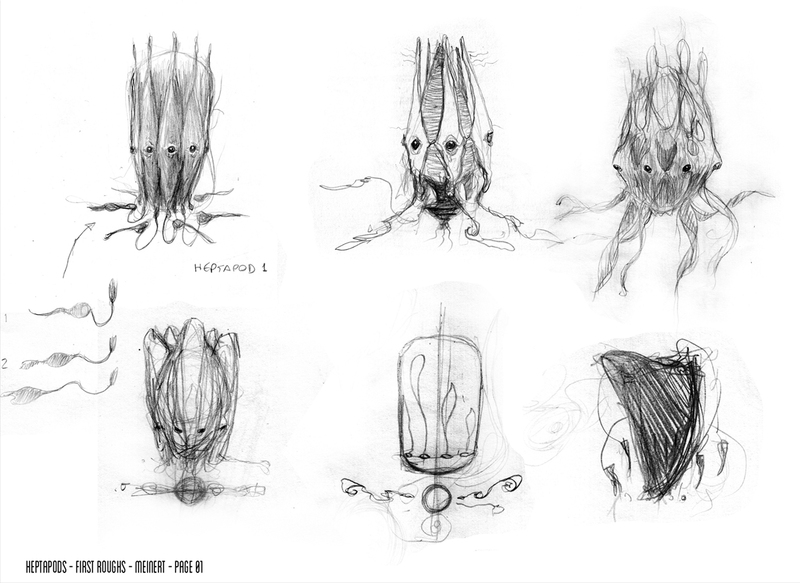 In the end, veteran creature designer Carlos Huante was the one that got it right; his majestic and mysterious heptapods embodied all the qualities Denis was looking for. 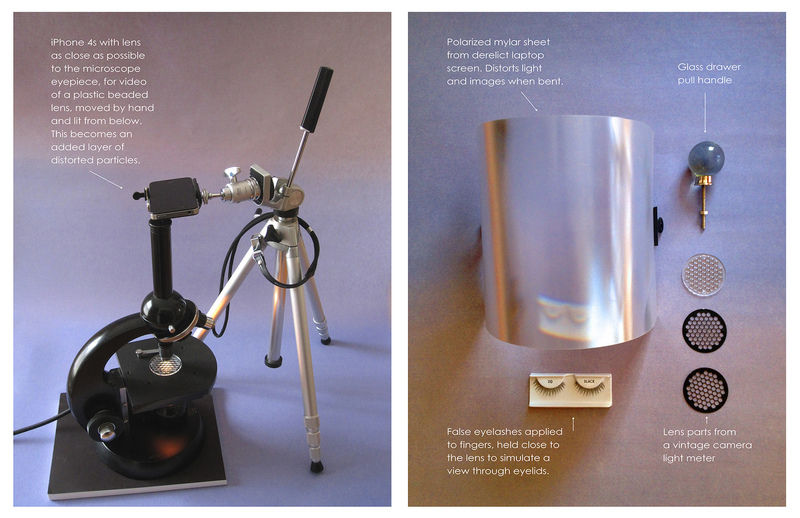 My contributions were more to see if I could come up with something different than the other guys, so I had a little free reign to mess around with ideas, with the mandate to “design something we haven’t seen before.” I had only a couple of weeks for this task, so I experimented more with shapes and impressions. Below are just a few samples of ideas I tried. In hindsight, after seeing the film, I’m glad these didn’t make the cut, as I was going a bit too abstract to identify with the beings. Once again, I’m still so grateful that I got to work on such an incredible film, even if my part was small. 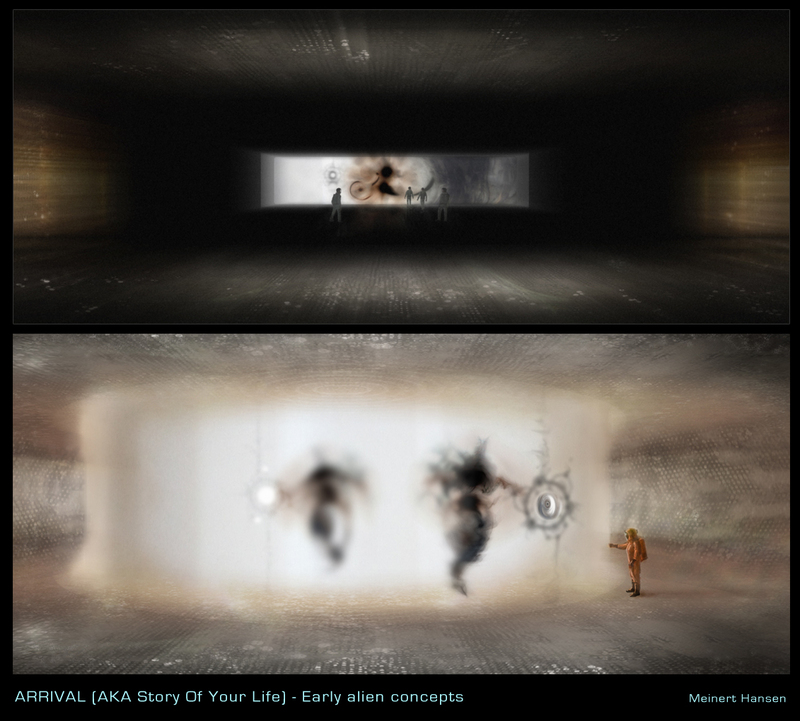 A fairly abstract version of the aliens. 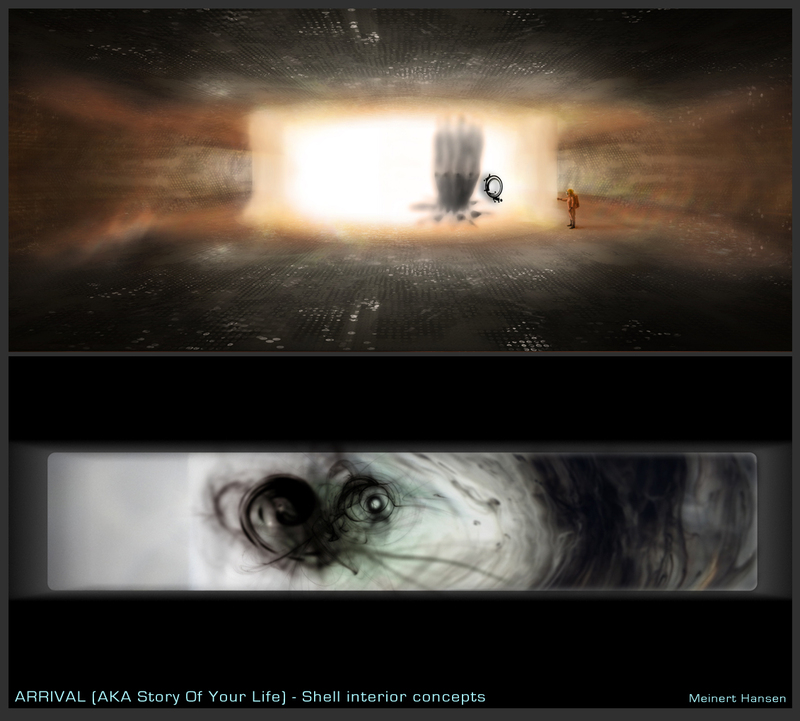 My first doodles, based more on the original short story, “Story Of Your Life,” by Ted Chiang. 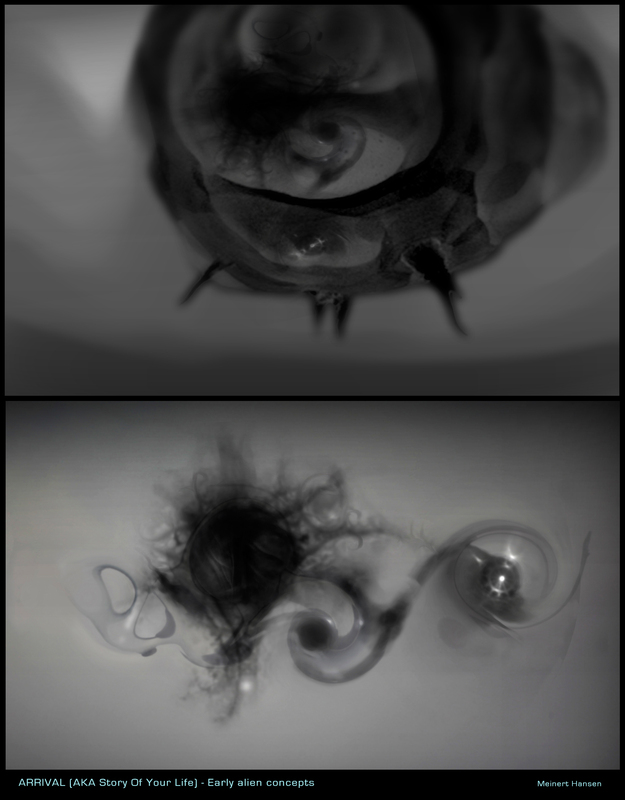 More shape explorations. 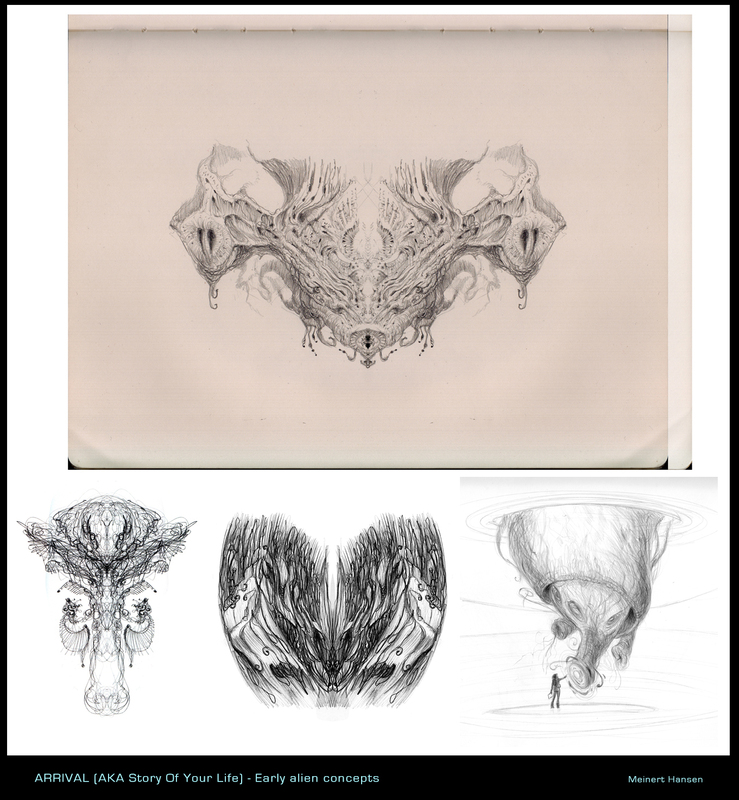 The bottom two rows were created using Alchemy, a little drawing app that allows you to draw symmetrical objects. 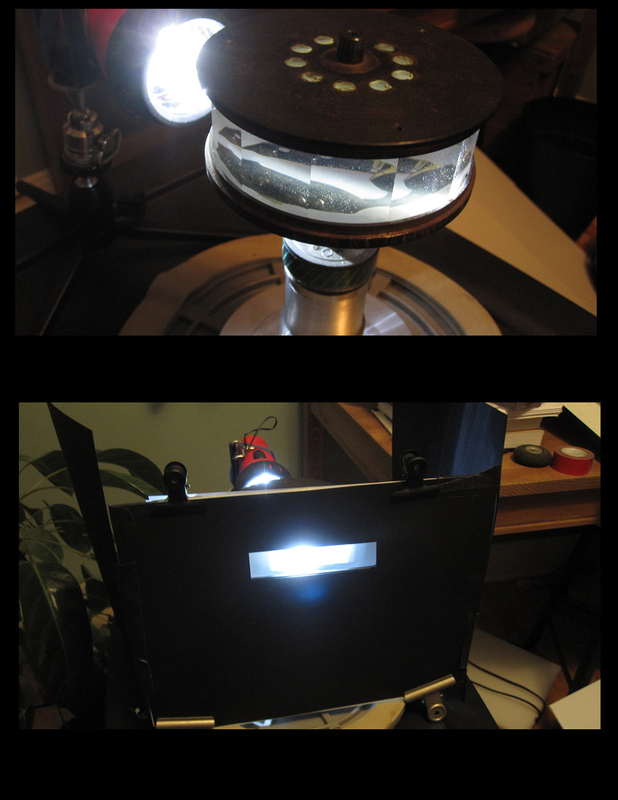 I built this contraption, with a 16-sided prism from an old film editing bench. The idea was to experiment with flickering light on the screen and see if I could create some kind of sense that the aliens entered and exited though a projection. The video below was taken with my phone camera. The last 3 or 4 seconds are what I thought had an interesting feeling. More roughs, playing with shapes and symmetry again. Getting weirder with ideas here. 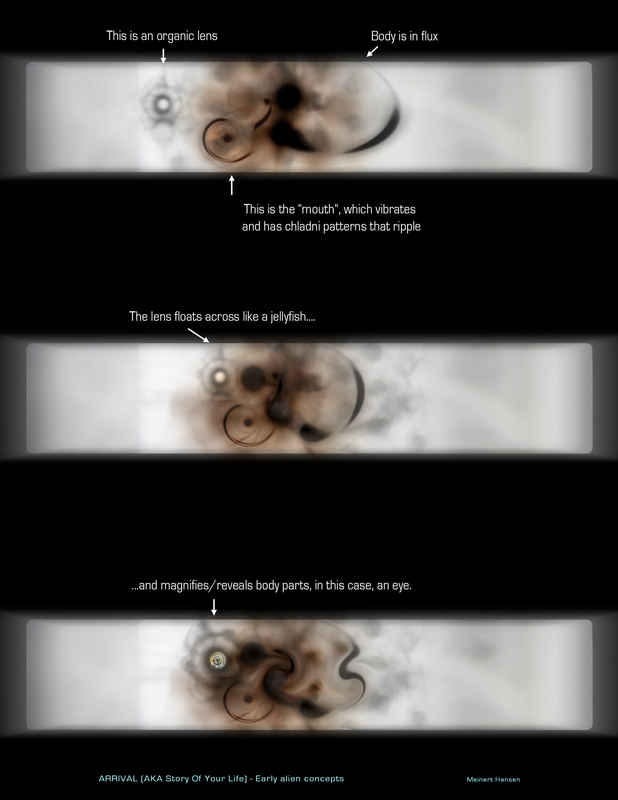 Playing with very alien anatomies, shape-shifting and kinetic forms. 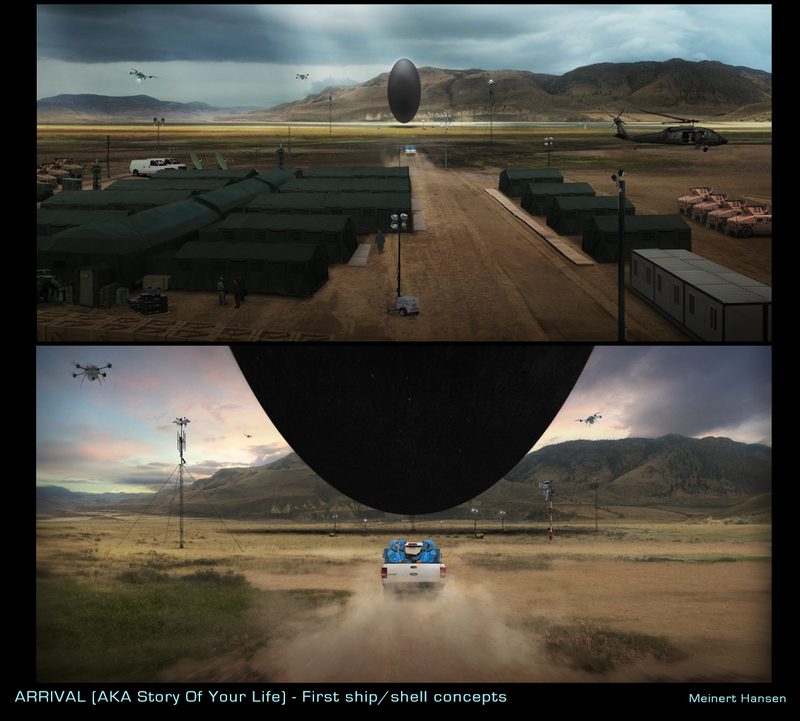 In February of 2015, I began work on “Story Of Your Life,” the Denis Villeneuve movie that would eventually be called “Arrival.” I worked with Patrice Vermette, the production designer to illustrate his and Denis’ ideas, and over the course of three months provided many variations of designs for the ship and its occupants. It was a real treat to be part of this film, and to work so closely with one of our most visionary directors, a real honour. Spheres were in the first script I read. 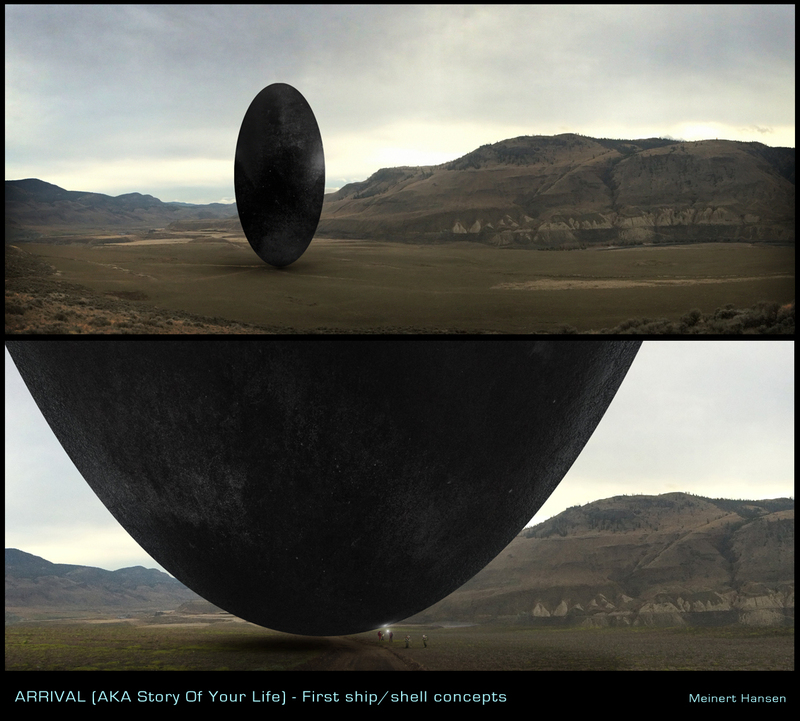 Thanks to Noah Bradley for his fine photos of Iceland, used in a couple of concepts here. The sphere shape was abandoned quickly at the start. 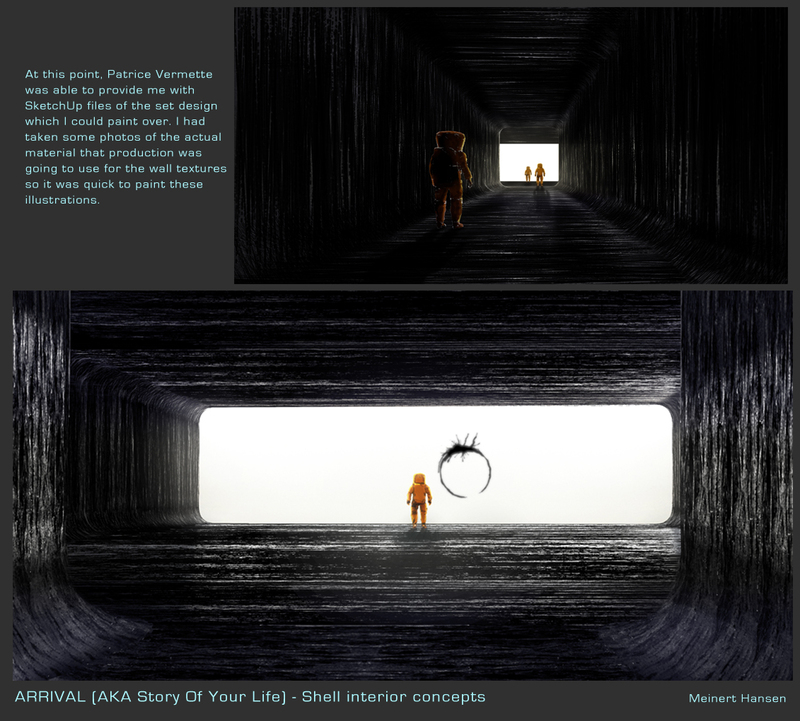 One of many texture exploration pages. 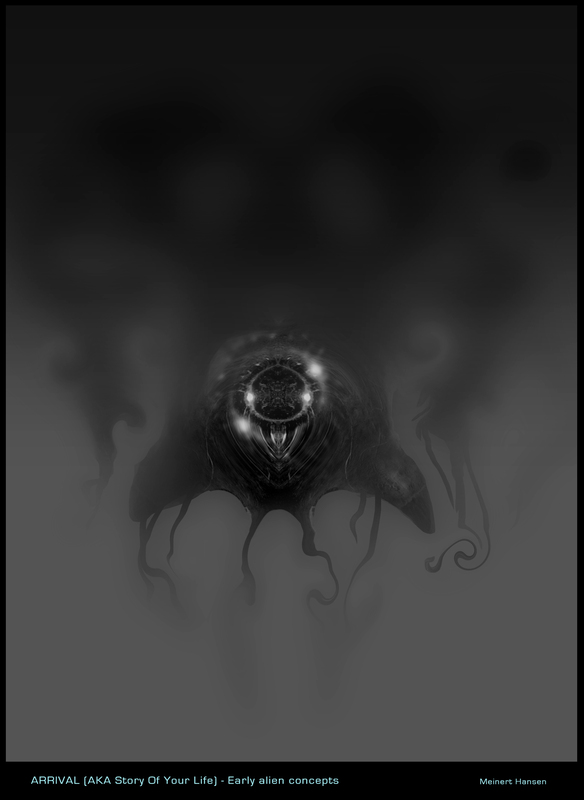 Getting closer to the final idea. An illustration of the basecamp, with the final design of the shell. Base camp, and on the way to the shell. 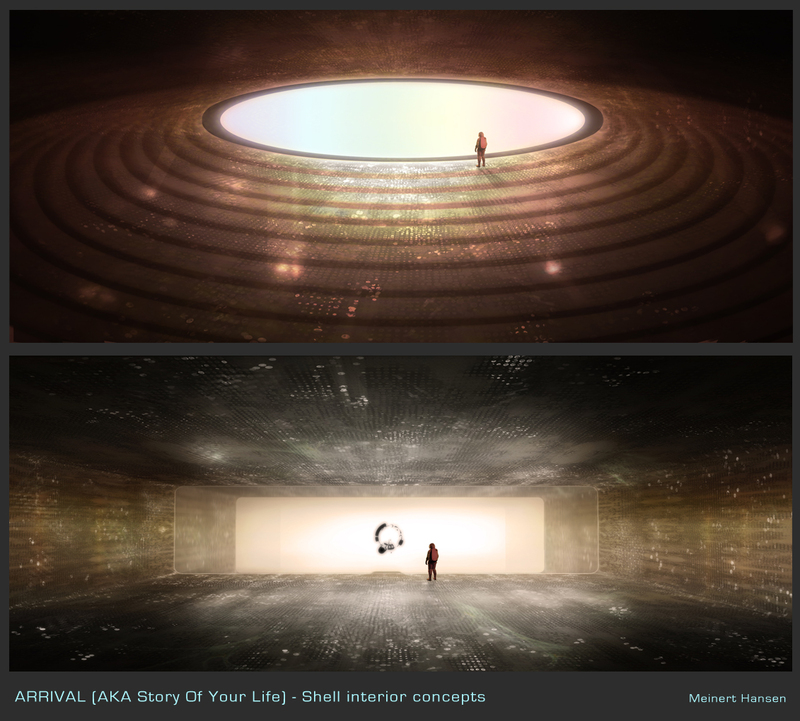 Early explorations of the meeting room in the shell had various shapes and colours at first. this was getting closer to what Patrice and Denis were looking for. 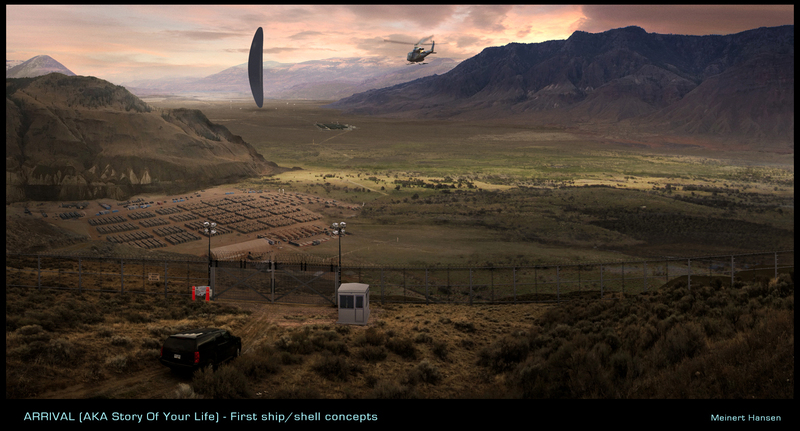 I loved the idea and simplicity of a wide and empty space – the exact opposite of typical cluttered movie spaceships. With less to distract, we pay more attention to the main characters. The top image was going to be called “The Meinert Room”. 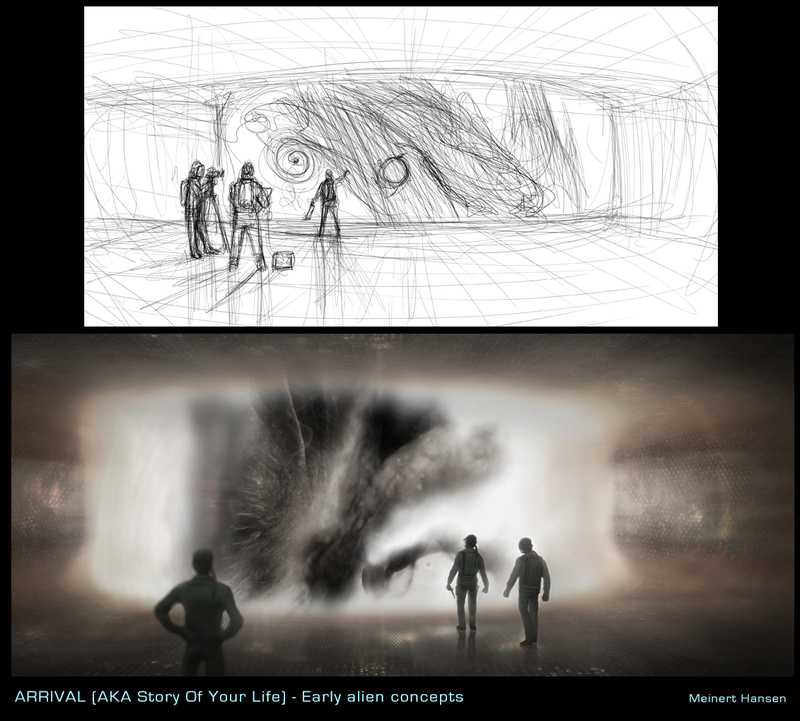 The way one “entered” the room – inside it while being outside it, like a Klein bottle, was going to be a challenge, FX-wise, and for set-design it added a bit too much to an already tight soundstage. 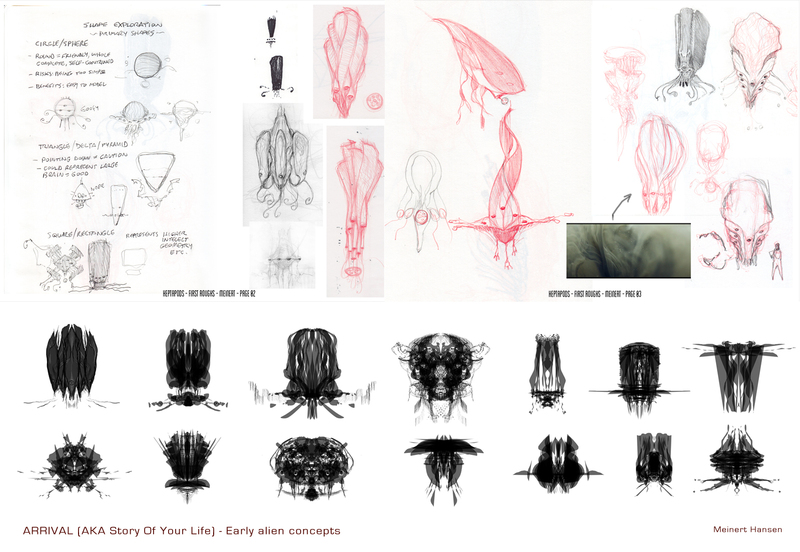 The bottom image shows some early exploration of the alien appearance.